Sufi saints or Wali (Arabic: ولي‎‎, plural ʾawliyāʾ أولياء) played an instrumental role in spreading Islam throughout the world. Sufi saints have emerged periodically to reshape the sacred in society. ↑ Schimmel, Annemarie (1975). Mystical Dimensions of Islam. Chapel Hill: University of North Carolina Press. p. 346. ISBN 0-8078-1271-4. ↑ Werbner, Pnina; Helene Basu (1998). Embodying Charisma: Modernity, Locality, and Performance of Emotion in Sufi Cults. Routledge. p. 3. ISBN 978-0415150996. ↑ Biographical encyclopaedia of Sufis: Central Asia and Middle East by N. Hanif, 2002, p. 123. ↑ The Sultan of the saints: mystical life and teaching of Shaikh Syed Abdul Qadir Jilani, Muhammad Riyāz Qādrī, 2000, p. 24. ↑ Pnina Werbner (2003). Pilgrims of Love: The Anthropology of a Global Sufi Cult. C. Hurst & Co. p. 4. ↑ S Ahmed Ali (2002-12-22). "On Urs, Mumbai police keep tryst with Sufi saint". Retrieved 2009-11-13. ↑ E.G. Browne (1998). Literary History of Persia. ↑ originally compiled by Amir Hasan ʻAlāʼ Sijzī Dehlawī ; English translation with introduction and historical annotation by Ziya-ul-Hasan Faruqi. (1996). Fawa'id Al-Fu'ad--Spiritual and Literary Discourses of Shaikh Nizammuddin Awliya. South Asia Books. ISBN 8124600422. ↑ The Brahmaputra Beckons. Brahmaputra Beckons Publication Committee. 1982. p. 39. Retrieved 2008-09-05. ↑ Jagadish Narayan Sarkar. Thoughts on Trends of Cultural Contacts in Medieval India. p. 41. 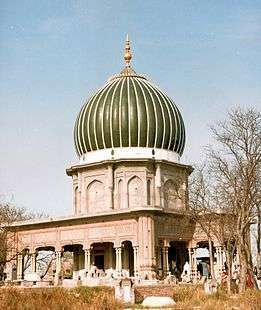 ↑ Urs-e-Sharief of Khwaja Bande Nawaz in Gulbarga from tomorrow "The Hindu", Nov 27, 2007. ↑ "Article on KhwajaBaqi Billah". Retrieved 2009-11-15. ↑ Ernst, Carl W. (1997). The Shambhala Guide to Sufism. Boston: Shambhala. p. 67. ISBN 978-1570621802. 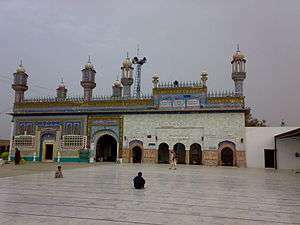 ↑ "Dargah of Bu-Ali-Shah-Qalandar". Retrieved 2009-11-08. ↑ "CHISTI SAINTS". Retrieved 2009-11-09. 1 2 Schimmel, Annemarie (1997). My Soul Is a Woman: The Feminine in Islam. New York: Continuum. p. 50. ISBN 0-8264-1014-6. ↑ Muntakhab-ut-Tawarikh’, Vol II and III, by Abdul Qadir bin Mulik Shah Al-Badaoni (Translated into English by R.A. Ranking in 1894). ↑ Sandeep Singh Bajwa. "Baba Fariduddin Mas'ud". Retrieved 2009-11-08. ↑ Neeti M. Sadarangani. Bhakti poetry in medieval India. p. 60. ↑ "Haji Huud" (Oct. 1, 2001). Published in Al Ashraf: Pages 17–20. ↑ G. M. D. Sufi. "THE SPREAD OF ISLAM IN KASHMIR". Retrieved 2009-11-09. ↑ William C. Chittick. "ʿERĀQĪ,FAḴR-al-DĪN EBRĀHĪM". Encyclopedia Iranica. Retrieved 2015-11-17. ↑ Sarah Ansari (1971). Sufi Saints and State Power: The Pirs of Sind, 1843-1947. Vanguard Books. ↑ K J S Ahluwalia22 (May 2006). "Spot the Emperor in the Story of Fakir Mian Mir". The Times Of India. Retrieved 2009-11-15. ↑ Gibb, H.A.R. ; Kramers, J.H. ; Levi-Provencal, E.; Schacht, J. (1986) [1st. pub. 1960]. Encyclopaedia of Islam (New Edition). Volume I (A-B). Leiden, Netherlands: Brill. p. 69. ISBN 9004081143. ↑ "HISTORY OF MULTAN". Retrieved 2009-11-08. ↑ Carl W. Ernst; Bruce B. Lawrence (2002). Sufi martyrs of love: the Chishti Order in South Asia and beyond. New York: Palgrave Macmillan. p. 98. ISBN 1403960275. ↑ Gupta, M.G. (2000). Sarmad the Saint: Life and Works (Revised ed.). MG Publishers. ISBN 81-85532-32-X. ↑ Carl W. Ernst, Bruce B. Lawrence. (2002). Sufi Martyrs of Love: The Chishti Order in South Asia and Beyond. New York: Palgrave Macmillan. ISBN 1403960267. 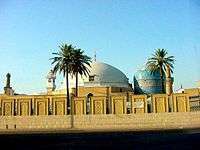 ↑ Tasadduq Husain (Jul–Aug 2002). "The Spiritual Journey of Dara Shukoh". Social Scientist. 30 (7/8): 54–66. doi:10.2307/3518151. JSTOR 3518151. ↑ DRAMK DURRANI (1989). "Central Asian Saints of Multan.". Area Study Centre (Central Asia), University of Peshawar. ↑ Karim, Abdul (2012). "Shah Jalal (R)". In Islam, Sirajul; Jamal, Ahmed A. Banglapedia: National Encyclopedia of Bangladesh (Second ed.). Asiatic Society of Bangladesh. ↑ Kānunago, Sunīti Bhūshaṇa (1988). A History of Chittagong. Dipankar Qanungo. Dipankar Qanungo. p. 476. Retrieved 2009-11-07. ↑ Muhammad Dawood. "Jalaluddin Surkh-Posh Bukhari". Retrieved 2009-11-08. ↑ Dr. Harbhajan Singh (2002). Sheikh Farid. Hindi Pocket Books. p. 11. ISBN 81-216-0255-6. ↑ edited by Masood Ali Khan, S. Ram. (2003). Encyclopaedia of Sufism. New Delhi: Anmol Publications. ISBN 8126113111. ↑ ZH Sharib (2006). The Sufi saints of the Indian subcontinent. Munshirm Manoharlal Pub Pvt Ltd.
↑ N. Hanif. Biographical encyclopaedia of Sufis. p. 321.